News and information for people who are united by a love of singing and a commitment to Overgate Hospice. Sale of goods at rehearsals – books, CDs, jam, vegetables, fruit, craft work -donated and purchased by our members raised £657 in 2013. 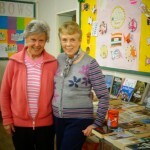 Loraine Greenwood and Val Gledhill are pictured with the stall. Please give Joyce Sharp, our Treasurer, your annual subscription which we contribute to cover the cost of our weekly rehearsals. The subscription for 2014 is £70 with a reduction of £5 if you pay Joyce by Wednesday, 26th. March 2014. 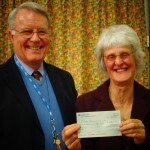 At the Annual General Meeting, John Hone presented a cheque for £9,000 to Val Steele, Chair of Overgate Hospice Board of Directors. Since 1991, the Choir has raised £244,626 for Overgate Hospice. At the Annual General Meeting held on Wednesday, 19th. 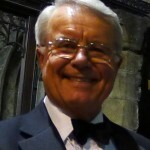 February 2014, John Hone was elected Chairman. On Wednesday January 22nd. 2014, Janet Cawtheray, Chief Executive, and Laura Golding, Fundraising Manager attended the rehearsal and expressed their appreciation of the work of the Choir. 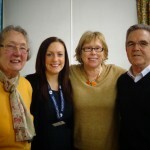 To-date Overgate Hospice Choir has raised £330,626! See the tickets page for information how to buy tickets.